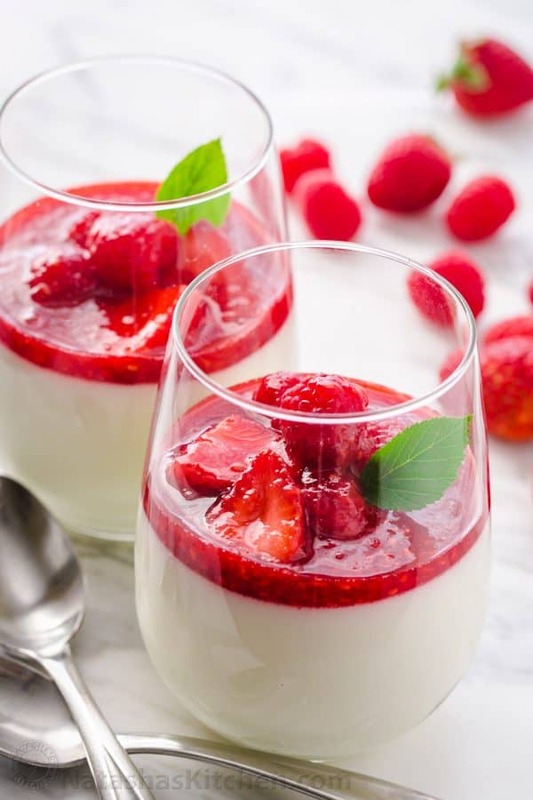 Panna Cotta looks and tastes fancy but is quick and easy to make! The fresh berry sauce makes every creamy spoonful perfectly sweet and tangy. We love these mini desserts for parties! 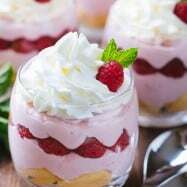 Some of our favorites include chocolate mousse, these raspberry mousse cups, or mini cheesecakes. They are elegant and surprisingly simple. I recreated this Panna Cotta after trying it in the Papa Haydn restaurant. It was love with the first spoonful, but my frugal self didn’t like paying $8/ serving. I could make 6 servings for that price tag at home! I actually like this homemade version more with the fresh berry sauce. Good news! This Panna Cotta takes about 20 min to make before refrigeration. Easy, peasy! 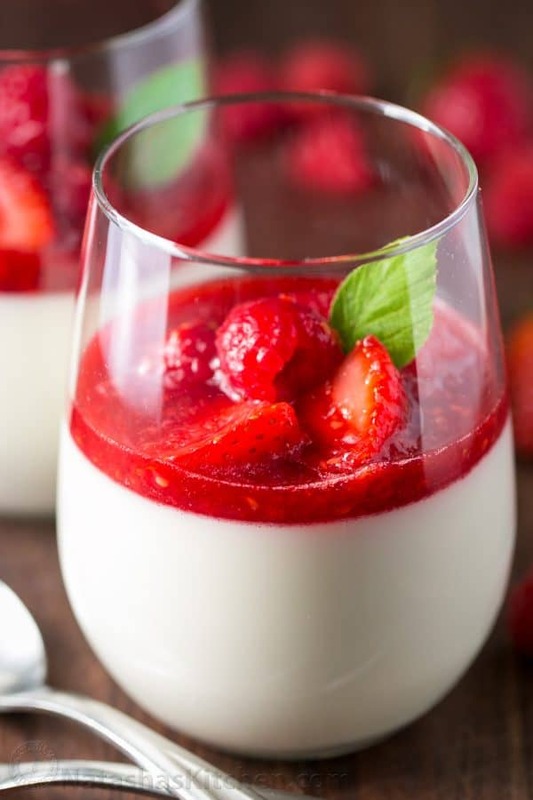 Panna Cotta is a creamy Italian jello/pudding like dessert. It has an incredibly smooth, melt-in-your-mouth texture like nothing else. The name means “cooked cream.” It is often served in restaurants removed from it’s cup onto a plate, but we prefer it served in cups topped with berry sauce. P.S. If you aren’t able to find the unflavored gelatin in the baking aisle of your grocery store, you probably weren’t looking hard enough (kidding). You can stock up on Amazon (affiliate link). Is this a Make-Ahead Dessert? YES! 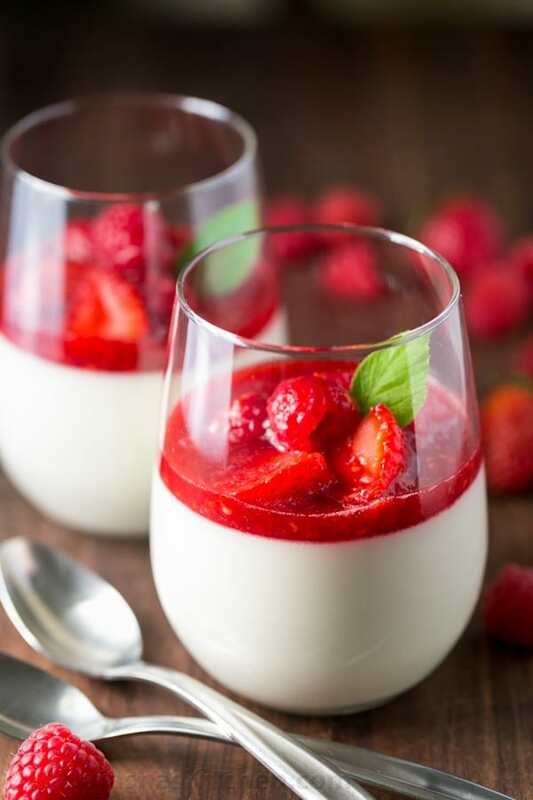 Panna Cotta can be made in advance so it is perfect for entertaining! Serve it in wine glasses at your next dinner party, or in tiny shot glasses for a larger gathering (think: baby shower, bridal shower, church potluck, etc.). 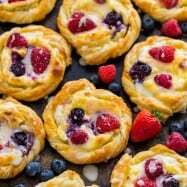 Add the berry sauce and garnish with basil if desired just before serving. I hope you are excited to give this recipe a try! Be sure to report back and let me know how much you loved it. 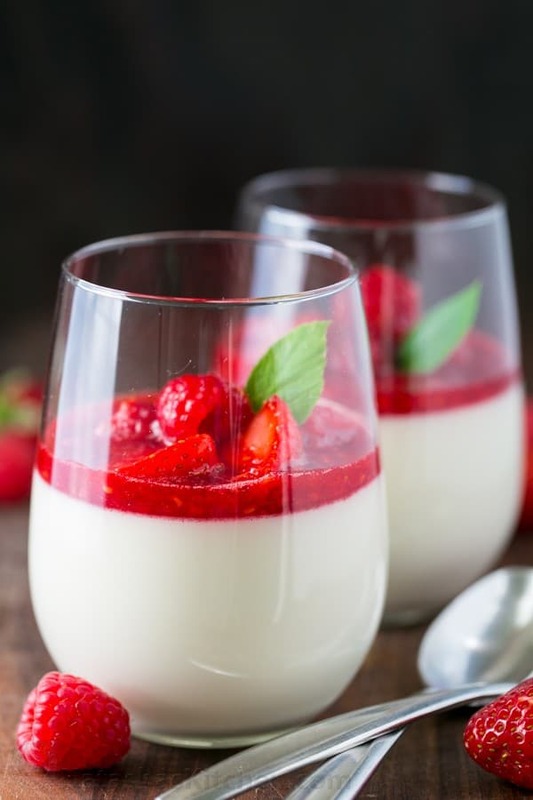 Panna Cotta is an Italian dessert that looks and tastes fancy but is so quick and easy to make! The fresh berry sauce gives every creamy spoonful the perfect balance of sweet and tangy. Off the heat, place 1 cup milk in a medium sauce pan and sprinkle the top with 1 packet gelatin. Let stand 3-5 min or until gelatin is softened. Place pan over medium/low heat and stir until gelatin dissolves and mixture is steaming, about 4-5 min (do not boil). Add 2 cups heavy whipping cream, 1/2 cup + 1 Tbsp sugar, 1 tsp vanilla and a pinch of salt. Continue stirring about 5 min until sugar is fully dissolved and mixture is steaming (do not boil). Remove from heat and let cool 5 minutes. Place sour cream in a medium bowl with a pouring lip. Whisking constantly, gradually add warm cream. Once the mixture is completely smooth, divide it into 6 wine glasses or 8 ramekins. 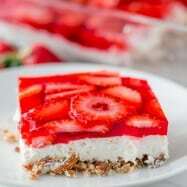 Refrigerate until fully set; 4 to 6 hours. 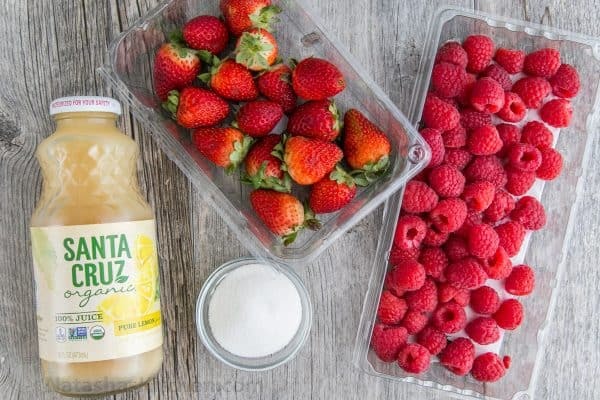 In a small sauce pan, combine 1 cup berries, 1/2 Tbsp lemon juice and 3 Tbsp sugar. Bring to a low boil and cook 4-5 min or until syrupy. Stir in remaining 1 cup of fresh berries and remove from heat. When syrup is at room temp or just barely warm, spoon it over the top of chilled panna cottas. Make this for someone you love. The flavor and texture are incredible and it’s a memorable treat! Just wanted to say that i am making it for probably 5-6th time and it never fails to impress! LOVE IT!Everyone loves it especially hubby! hi Natasha. I made your Panna Cotta Berry dessert and the mixture did not set. 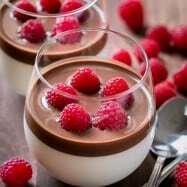 I have looked up gelatin ratios and one sachet will set 2 cups of liquid. Your recipe has 4 cups of milk / creams yet you suggest one sachet of gelatin…..not enough! OR is the amount badly stated and I needed one sachet AND 2.5 tspns of gelatin. We all at family loved this, infact had a second serving. But I think my cream didn’t set as good as your yours, I am not sure though. It was of yoghurt consistency. Is that the consistency it is supposed to be? We don’t get heavy whipping cream here. I used whipping cream. Rest everything was as it is. Thanks for replying me Natasha. Silly question, can this recipe be doubled or tripled? I am cooking for 18-24 and would love to do this for our Italian based luncheon. I would probably divide the panna cotta into smaller plastic cups. Do you have any tips for me if I want to remove the set panna cotta from ramekins/moulds instead of serving in a glass? Hi Natasha, So after you make these and place in fridge to use before eatting, Do you individully cover each one with plastic wrap? Or If I make em the day before, best to wrap em in plastic wrap? Hi Tatyana, I haven’t tried it to say for sure or what changes would have to be made in the preparation. Wow! This dessert made a sensational statement on the dining table! They were also thoroughly enjoyed by all, people forgot their manners and were trying to lick their glasses clean! I’m not great in the kitchen but this was very easy and fun to create!! I want to make these for a party in small single serving cups. Can I double the recipe? Or should I make separate batches? I need about 30-40 small servings. …oh, one more thing, can I assemble the day before or only just before serving? Thank you Natasha! I doubled the recipe and bought 5 oz cups. They were about half full. It made about 30-35 cups (i didn’t count them). Amazing recipe! My husband and daughter are obsessed. Hi, I’m thinking of making this for my daughters wedding. Do you think if I made it a couple of days in advance and leave it in the fridge it would be ok? Awesome now another question should I add the fresh fruit in the same day as well -? Hi Ann, you can do it the same day or the next – either will work fine as long as the berries aren’t overly ripe. Tried for the first time last night – love the tangy-ness the sour cream imparts. Set in wine glasses, and used blueberries for the sauce. This dessert is de-li-ci-ous!!! I have never had pana cotta before.. 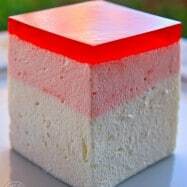 I was looking for a lighter recipe with jello and I found this one in your blog. We loved it!! I didn’t have heavy whipping cream so I substituted it with 0% fat greek yogurt. It tastes sooo good!! 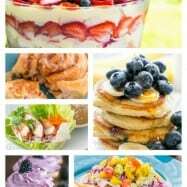 I was afraid of addind the sour cream because of the greek yogurt, so I didn’t add it either… The berry sauce is soo wonderful!!! This has just become one of my favorite desserts and I don’t feel very “guilty” for having it! Thank you so much Natasha! Your recipes are all awesome! P.S. : This afternoon I also made your overnight cinnamon rolls. I’ll bake them tomorrow for breakfast and then let you know the results… I love cinnamon rolls!!! I have a friend in Paris who gives cooking classes in Paris. 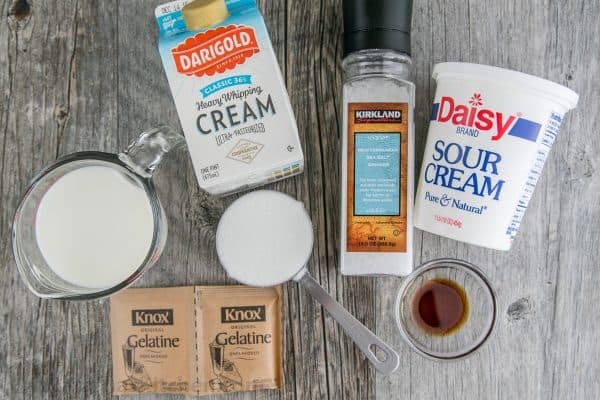 I asked her to send me this recipe and it called for cream fraiche liquid — think this is the best alternate US recipe because of the use of sour cream.